UPDATE - 6:45 pm: Greg Gutfeld discusses the bar on the Glenn Beck Show. Video below the fold. As we noted in this morning's Open Thread, Greg Gutfeld is planning on building the first gay bar catered to Muslim men next to the impending "Ground Zero Mosque." Gutfeld wrote at his blog, the Daily Gut, that he has "already spoken to a number of investors, who have pledged their support in this bipartisan bid for understanding and tolerance." On Twitter today, Gutfeld and the official twitterers of the Park51 project - the official name of the mosque - duked it out in what was a very telling exchange. See a full graphic of the back and forth below the fold, courtesy of Johnny Dollar (pic at right by way of Jim Treacher). 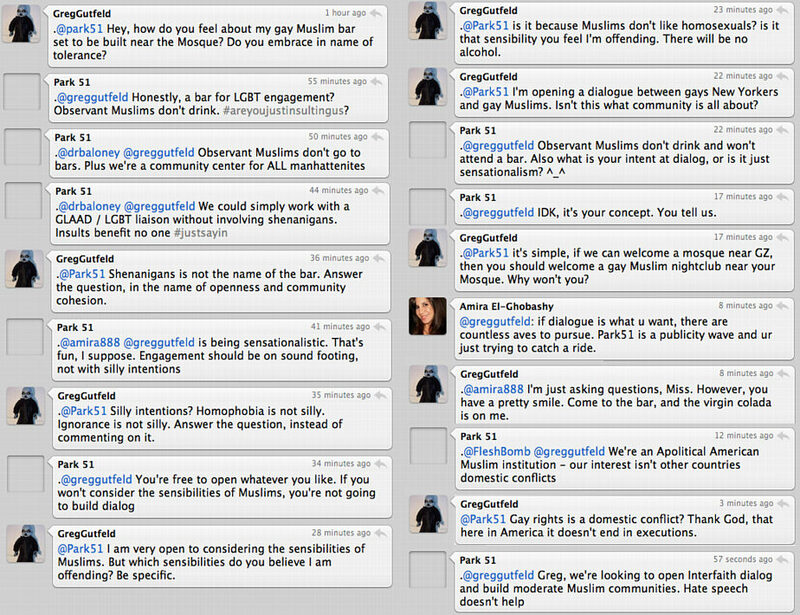 "He's got a point," notes Allahpundit in reference to Park51's tweet concerning "Muslim sensibilities." "Construction projects that fail to consider local cultural sensitivities aren't very conducive to dialogue, are they?" Indeed, the entire exchange seemed to strengthen Gutfeld's position. He shouldn't offend Muslim's sensibilities? Well what about New Yorkers' sensibilities? 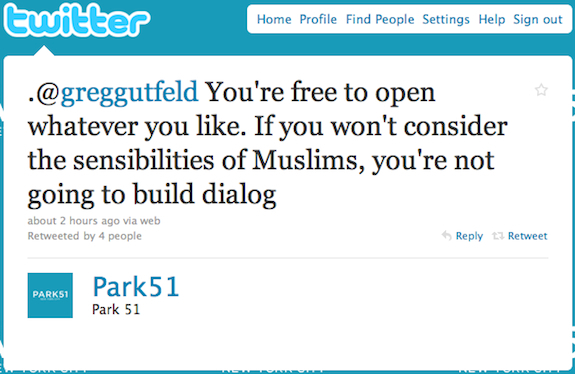 How is Park51's total disregard for those sensibilities any more constructive in building a dialogue than Gutfeld's? Outrage over Gutfeld's move only reinforces the point his project is making (whether or not he intends it): yes, everyone has a right to build wherever they like, as long as they do it legally, but that "sensibilities" are a two-way street. Since Park51 has apparently taken a stance against Gutfeld's bar, will media liberals condemn the mosque's proprietors as homophobes the same way they condemned mosque opponents has Islamophobes? Individuals who opposed the mosque's construction have been dubbed "bellicose," "xenophobic," "Nazis," and "intolerant know-nothings," while the mosque itself has been labeled a "monument to religious tolerance." The Twitter exchange today demonstrated the double standard espoused by the mosque's proprietors. Will the media personalities who so vilified the mosque's opponents endorse that same double standard? Or will they defend Gutfeld's attempt to promote a dialogue about the treatment of homosexuals in most Muslim nations and communities, even if it means offending a few people? *****UPDATE: Big hat tip once again to J$. *****UPDATE 2: Gutfeld and Beck: Islamophobes and homophobes?